Latest releases of DownStream�s industry leading CAM350 for PCB fabrication and revolutionary documentation tool BluePrint for PCBs have now been integrated and packaged together to deliver a unified suite of tools for PCB post processing. The result of these efforts is CAM350XL the industry�s first unified solution for PCB post processing. CAM350XL is an integrated suite of tools that unites all PCB post processing tasks, including: DRC/DFF analysis with Netlist compare, paste and solder mask generation, Gerber file creation, NC drill and mill creation, assembly panel arrays definition, PCB documentation, and ECO automation. CAM350XL&qout;s database allows all necessary outputs to be contained in one electronic file or �Release Package� to drive fabrication, assembly, test, and QA/QC processes anywhere at anytime. 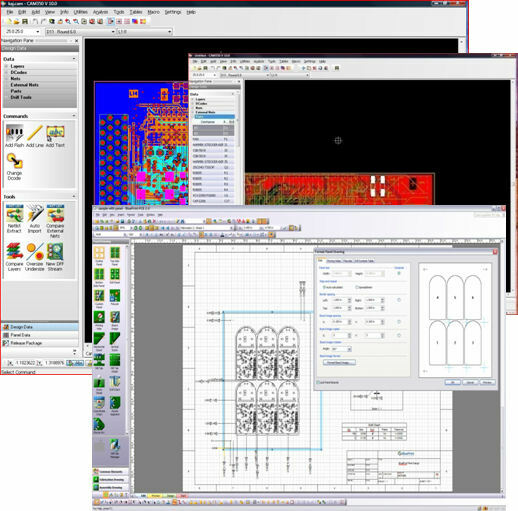 Within the electronic release package you can generate and view PCB documents, PCB layout data, generate and/or extract necessary Gerber, drill, and milling files, as well as integrate business file formats such as PDF files, MS Office, DXF files, which may be required to fabricate and assemble the physical PCB. CAM350XL provides a uniform solution to support the back end of the PCB design tasks by using an electronic Release Package database to generate and compile all the necessary deliverables required to build the physical PCB.